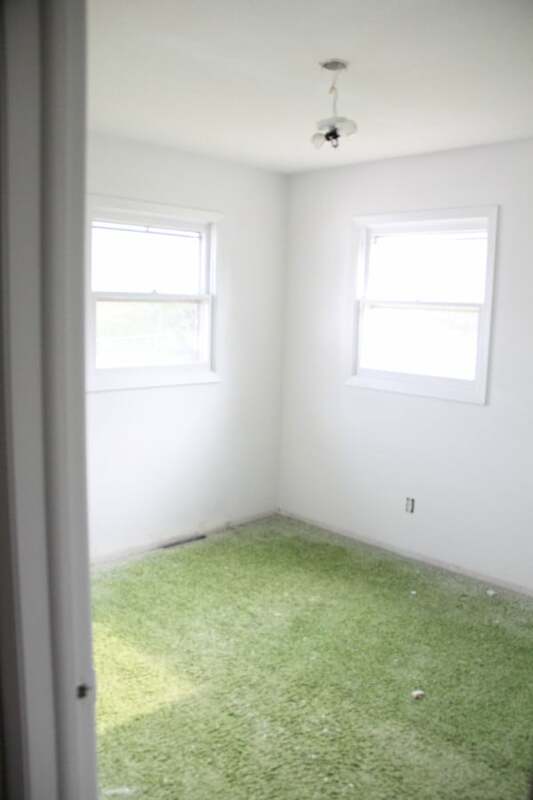 If you’ve been following along with our Retro Ranch Reno, you know that we’ve been tackling some pretty big projects. 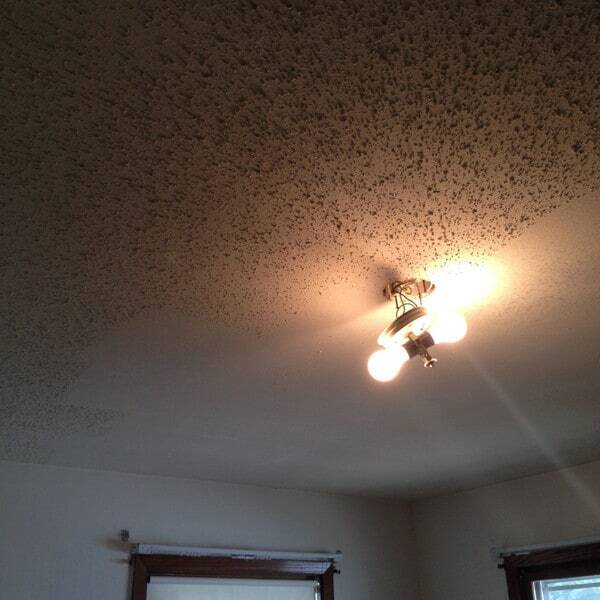 Probably my least favorite of them all was scraping the popcorn ceilings. You can’t tell in this picture, but along with the thick popcorn, the ceilings were covered in glitter! 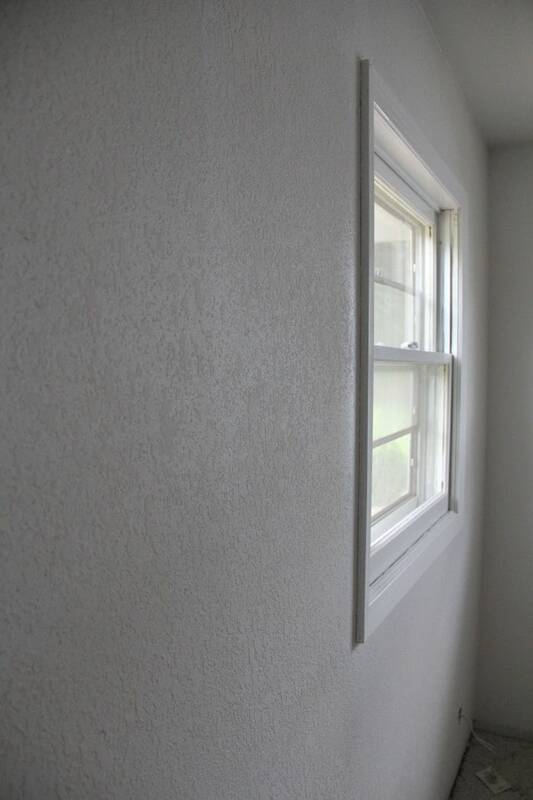 After surviving this project, I wanted to share my tips and tricks for scraping popcorn ceilings. A good friend of mine gave me her expert tip, which was to use a paint sprayer filled with water for soaking the ceilings. 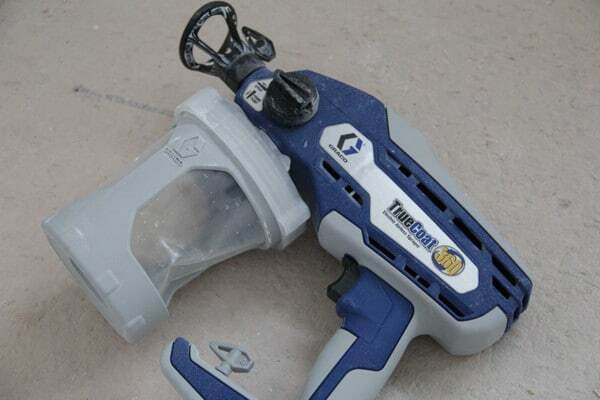 I LOVE my Graco 360 paint sprayer, and never even considered all of it’s uses when it comes to spraying water! *contains affiliate link* This was SO much better than using a spray bottle and exhausting your trigger finger. I actually learned that it worked the best if I sprayed the entire room heavily, and then about 15 minutes later came back and re-sprayed each section right before scraping it. 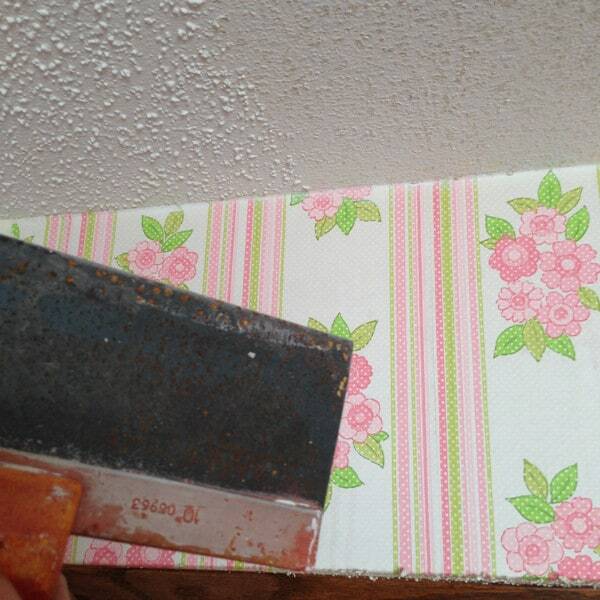 I used a this knife for scraping which worked pretty well. I wish I would have taken it a bit easier though, because I managed to really hurt my collarbone scraping so much. If I were to do it all over again I’d probably spray a third time so that I wouldn’t have to use as much force. It’s hard to see, but this picture shows how thick the popcorn was that was coming down. 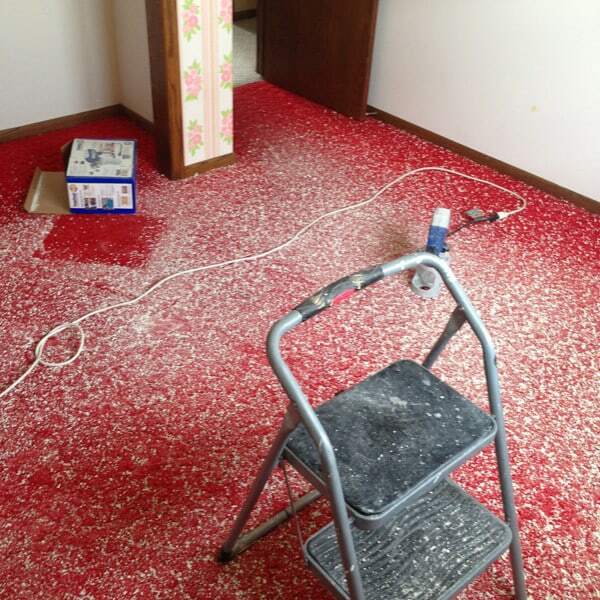 Yes, all three bedrooms, hallway, and the living room were covered in popcorn. 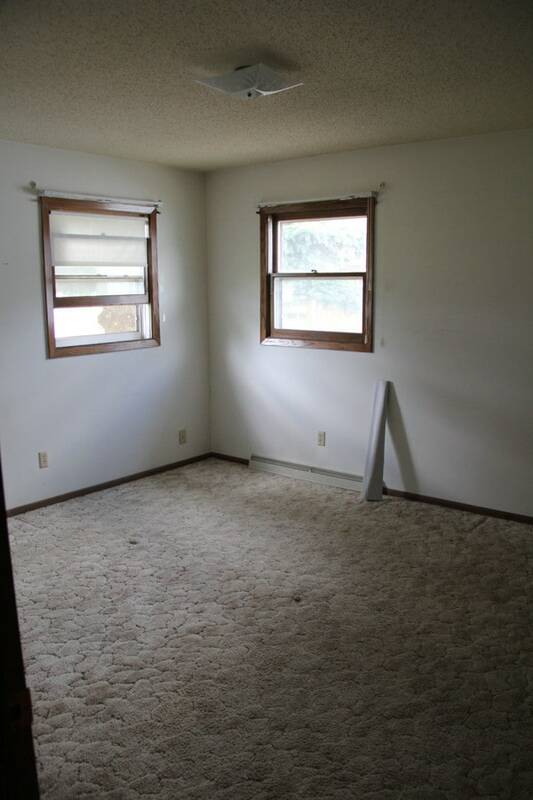 The whole house instantly felt lighter as the texture came down. This was SUCH a messy project. I am SO thankful that we are living in the basement and haven’t moved into the main level yet because it would have been a TOTAL disaster. My only advice on this is if you are already moved in and decide to scrape ceilings CLEAR OUT each room first, or you will be finding pieces of popcorn in your stuff forever. After getting EVERYTHING scraped, and the rest of the wallpaper removed, I went ahead and sprayed knockdown texture everywhere. I didn’t get any pictures of this part of the progress because spraying texture alone was hard enough! I did tape off all of the windows and closets while I sprayed. 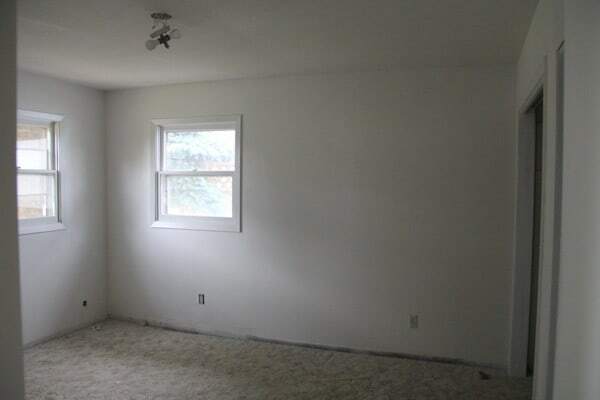 Now that everything is primed I still have to paint the ceilings and walls. 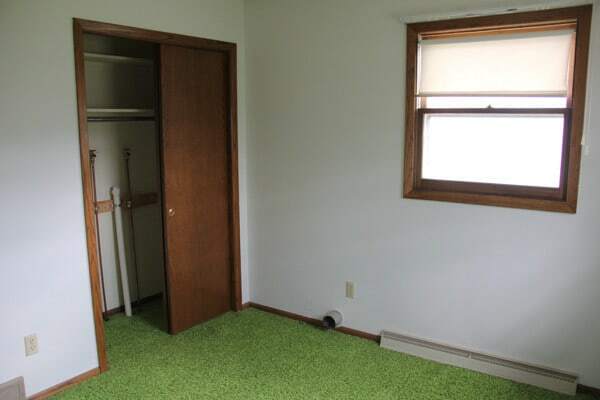 Then I’ll be removing carpet and be ready to lay flooring! 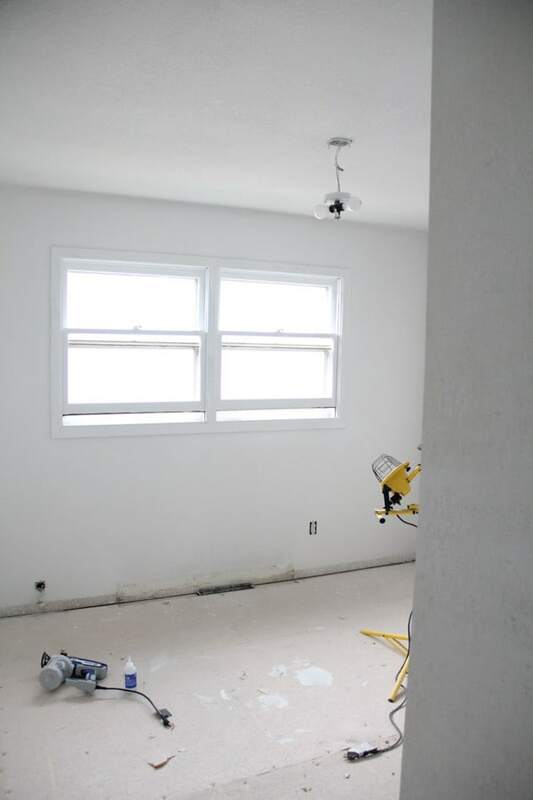 **5/29/16 edit** Many popcorn ceilings contain asbestos which needs to be abated by a professional. 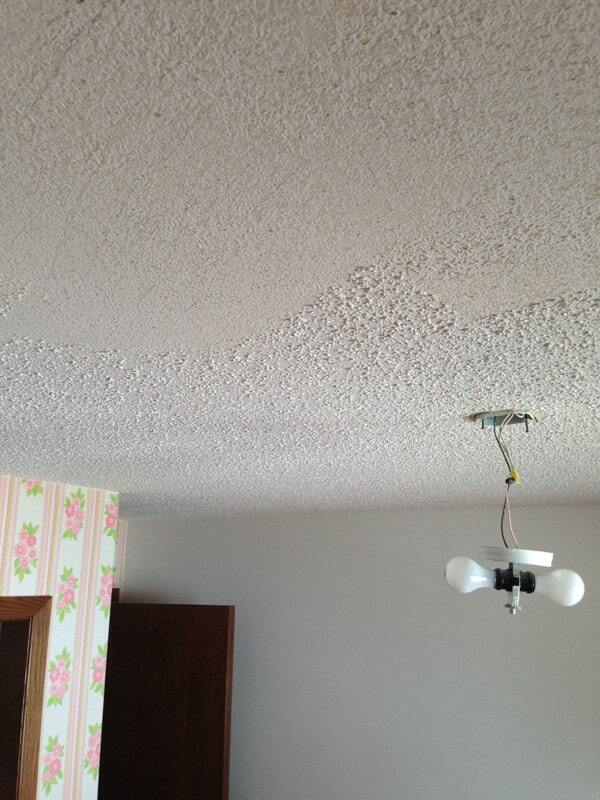 Before scraping your popcorn ceilings please test the material for asbestos. 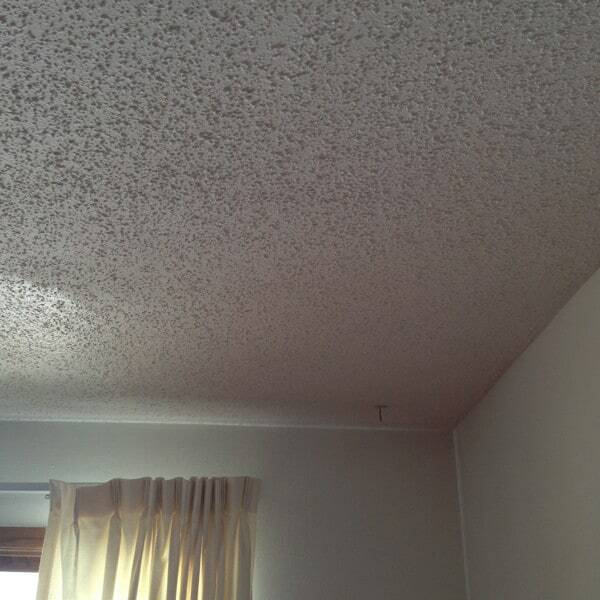 You do realize that popcorn ceilings almost always contains asbestos? This was very unwise and you should have had a professional come in and abate this as well as preform a clearance test afterwards to ensure that there were no fibres left in the air. Thanks for the concern. We actually sent out samples for testing for almost every surface in the house. Thankfully they came back clear. 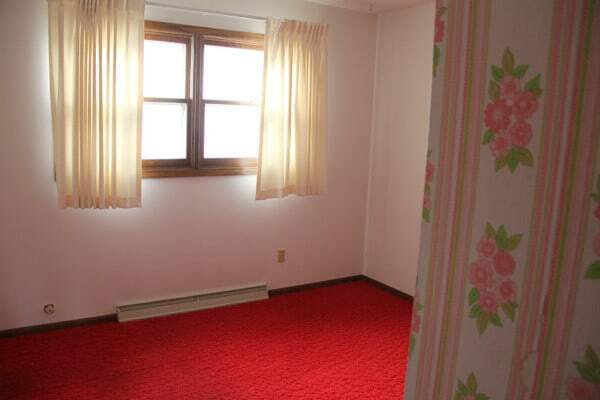 We have had one positive asbestos test for basement floor tiles once, but we were able to carpet right over them. I have learned to hold a paint tray to catch the ceiling popcorn – floor doesn’t get as messy. Smart! Because we were gutting everything it didn’t matter… I can’t imagine having to clean it all up!